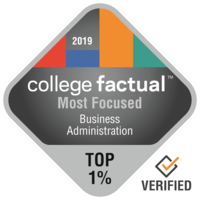 The Colleges Most Focused on Business Administration & Management in the U.S.
Go to a school focused on Business Administration & Management so that you can have a wide range of opportunities and develop connections. Discover more about the colleges listed below and learn all their Business Administration & Management programs have to offer. If you’d like to learn more about how the schools below were ranked visit the Most Focused Ranking methodology page. If you're looking for the very best training out there in Business Administration & Management you simply can't do better than Babson College. With 541 students enrolled, Business Administration is quite a popular major at Babson College. It is established in the suburban area of Wellesley, Massachusetts. Babson College supports collaboration between students and their educators, helped by the 11:1 student-to-faculty ratio. There is a grad program obtainable for students who are intrigued. Learn more to see just how well Babson College ranks in other categories. Any student pursuing a degree in Business Administration & Management has to take a look at IGlobal University. 100.0% of undergrads at IGlobal University are Business Administration students. Situated in Vienna, Virginia, IGlobal University offers a safe, suburban atmosphere for young people. 100.0% of first-year students come back for their second year of school. IGlobal University has an impressive student-to-faculty ratio of 13:1, so learners should have a lot of opportunities to network with their teachers. The scorecard provides a good review of IGlobal University. It's difficult to beat Colorado Heights University if you want to pursue Business Administration & Management as a major. Experience a strong concentration on Business Administration & Management in the major at Colorado Heights University. Denver, Colorado is the best surrounding for college students who get pleasure from the fast-paced urban lifestyle. There is a grad program obtainable for those who are intrigued. Freshman students are not required to live on-campus at Colorado Heights University. Check out some school videos to learn more about what's happening on campus. It is hard to beat Hult International Business School if you want to study Business Administration & Management. We have determined that the Business Administration major at Hult International Business School is very focused. Positioned in Cambridge, Massachusetts, this college is a sound final choice for students who enjoy the excitement of a major city. For those who would like to carry on after earning a bachelor's degree, Hult International Business School has graduate programs available. Due to the diverse population at Hult International Business School, you should have numerous opportunities to interact with individuals from many walks of life. Go on a virtual tour to know more about Hult International Business School. Taft University System is a good decision for students pursuing a Business Administration & Management degree. Business Administration is a popular choice at Taft University System with over 3 graduations in 2017. This school is located in the suburban region of Denver, Colorado, near shops and other amusement. There is an advanced degree program obtainable for those who are intrigued. Taft University System's 12:1 student-to-faculty ratio is one of the very best in the United States. For details, look at college scorecard. Millennia Atlantic University is one of the best schools in the United States for Business Administration & Management. Experience a strong focus on Business Administration & Management in the major at Millennia Atlantic University. This school is located in the suburban area of Doral, Florida, close to shops and other entertainment. Freshman students are not required to live on-campus at Millennia Atlantic University. Around 100.0% of freshmen decide to come back to this school for their sophomore year. Get an idea of what being on campus at Millennia Atlantic University is really like by watching a few campus videos. It's hard to beat California Miramar University if you want to pursue Business Administration & Management as a major. With 1 undergraduates, Business Administration is one of most popular majors at California Miramar University. San Diego, California is an appropriate environment for students who relish the active city life. Freshmen are not required to live on-campus at California Miramar University. About 0.0% of California Miramar University's student body is from outside California, so, you are going to have lots of opportunities to befriend undergraduates from all over the country. Get all the crucial facts on California Miramar University by checking out their scorecard. University of Phoenix - North Carolina is a good choice for students pursuing a Business Administration & Management degree. This is quite a common major at UOPX - North Carolina, with 99.0% of undergraduates enrolled in it. Based in Charlotte, North Carolina, this university is a good choice for learners who prosper in a city atmosphere. Taking into consideration that 81.0% of students at this school receive educational funding, don't forget to complete the FAFSA. Freshmen are not required to live on-campus at University of Phoenix - North Carolina. For more information, look at college scorecard. New England College of Business and Finance is a great option for individuals interested in a Business Administration & Management major. With 154 undergrads, Business Administration is quite a popular major at New England College of Business and Finance. Placed in Boston, Massachusetts, this school is a good choice for students who enjoy the thrills of a major city. New England College of Business and Finance does not require freshman students to live on-campus. For those who wish to go on after earning a four-year degree, New England College of Business and Finance has graduate programs available. Go on a virtual tour for more information on New England College of Business and Finance. Every student pursuing a degree in Business Administration & Management needs to take a look at Golden Gate University - San Francisco. 96.6% of undergrads at Golden Gate University - San Francisco are Business Administration majors. The setting in a main urban center is great for young people seeking ample choices for networking, excitement, and exploration. This school offers grad degree programs for students who wish to proceed after achieving a bachelor's degree. This school is well-known for its support of military personnel and is the 234 best in the United States for veterans. Ever wish you had a simple way to find out a school's grades in each subject? Now you do. Check out Golden Gate University - San Francisco's scorecard.